The grim specter of sickness looms over the Weyrs of Pern, felling fire-lizards and posing a potentially devastating threat to their dragon cousins, Pern's sole defense against the deadly phenomenon that is Thread. Fiona, the youngest and only surviving daughter of Lord Bemin, is just coming of age, and about to assume the duties of a Weyrwoman, when word spreads that dragons have indeed begun succumbing to the new contagion. With the next season of Threadfall quickly approaching, and the already diminished ranks of the dragons once more under siege, every Weyr across Pern is in crisis mode. It is hardly the time for disturbing distractions - such as the strange voice Fiona suddenly hears in her mind at the darkest and most urgent moments. Circumstances and the mood of the weyrfolk worsen when advance patrols relay the dreaded news that black dust - the unmistakable herald of falling Thread - has been sighted. As more dragons sicken and die, leaving only a new generation of weyrlings too young to succeed them, Weyrleader B'Nik and queen rider Lorana arrive from Benden Weyr to comb Fort Weyr's archives in a desperate search for clues from the past that may hold the solution to the plague. But could the actual past itself prove the pathway to salvation for Pern's stricken dragons and the entire imperiled planet? 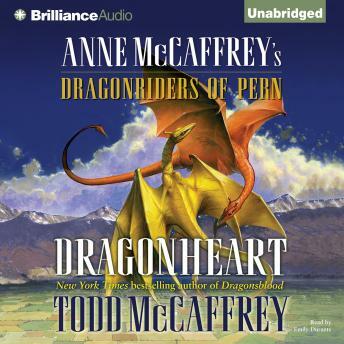 Guided by a mysterious ally from a wholly unexpected place, and trusting in the unique dragon gift for transcending time, Fiona will join a risky expedition with far-reaching consequences for both Pern's future and her personal destiny. I enjoyed the book, with its fill in storyline. While I admit it seems to leave a lot of stuff unanswered, if you are reading the books in chronological order as I am, you will find that there is less left unanswered than it might seem if you were to read the book as a stand alone or in its publication order. All in all I enjoyed the spin off story line and have already started into the next book in the chronological sequence. I found Emily Durante (the narrator) didn't differentiate audibly enough between characters, everyone sounded the same. Emily Durante, the narrator, was the best thing about this book. She brought life to otherwise aimless and lifeless characters. The story starts out interesting then trails off into a never ending series of events with no resolution. The final nail in the coffin, for me, was when nothing, at all, was resolved. While this may have been prologue to the next book I won't be listening to it.